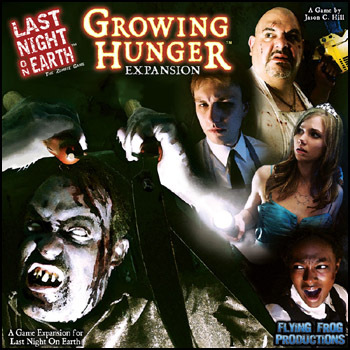 The Growing Hunger Expansion introduces new game mechanics and three exciting new Scenarios to challenge players as well as a two player mini-game. Take control of four new Heroes, each with a highly-detailed plastic miniature as well as seven new Red Zombies for use as Plague Carriers, Grave Dead, or to increase the Zombie Horde. New modular game board sections expand the town and feature unique buildings such as the Supermarket, Library, and Antique Shop. New game cards give Zombies a chance to steal weapons from the Heroes and add powerful Double-Handed weapons to the HeroesÃ¢â‚¬â„¢ arsenal, such as Garden Shears and the Fence Post. Also included are two new full color, die-cut counter sheets adding Free Search Markers for the Heroes as well as many more fun ideas to the Last Night on Earth toolbox for limitless use with official web content or creating your own new Scenarios. More Heroes! More Boards! More Cards! More Hunger!